President Trump signed the Tax Cuts and Jobs Act (TCJA) this morning, the GOP tax bill with an acronym that simply won’t roll off my tongue. A useful summary of the Act produced by the House -Senate conference, and the full text of the Act, appear at this link. The TCJA hews more toward the earlier Senate bill than the House version. I’ve written about both (the House bill here and both here). Here is a good summary of the Act from Peter Suderman at Reason.com. In my earlier assessments, I relied upon the principle of tax reform and real simplification as a justification for a tax cut without revenue neutrality. There are a few reforms and partial reforms, and the bill may simplify taxes for a number of individual taxpayers. However, on the whole I’m disappointed with the progress made by the GOP in those areas. Notwithstanding my disappointment with the overall reform effort, the TCJA cuts taxes for most Americans and is likely to have salutary effects on economic growth and the job market. In fact, one of the most remarkable things about the Act is the claim made by its adversaries on the Democrat side of the aisle. They apparently believe that the benefits of the TCJA flow primarily or even exclusively to the rich. This is a huge mistake for them. High-income taxpayers will receive greater benefits in absolute dollars, but not proportionally. 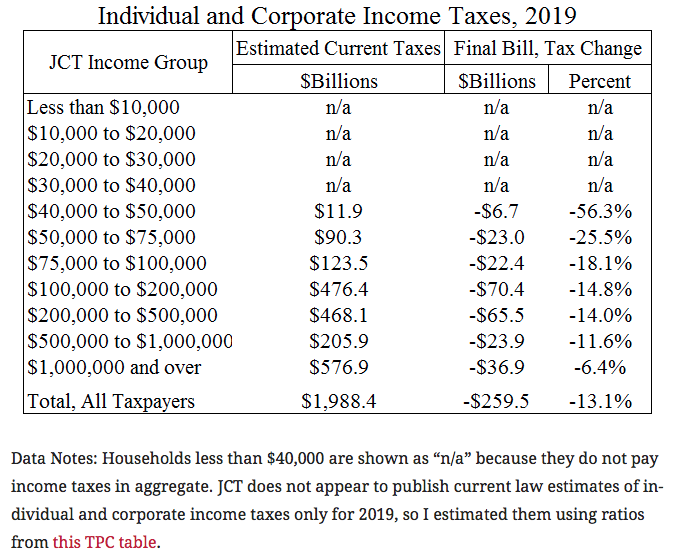 This is shown by the table above, prepared by Chris Edwards from data produced by the Joint Committee on Taxation (JCT). In fact, the TCJA will extend tax reductions to a larger share of the middle class than either of its predecessor bills would have done. You cannot meaningfully reduce the taxes generated by a steeply progressive tax system without reducing the absolute dollars paid by high-income taxpayers. And you can’t lay the groundwork for sustainable economic growth without improving the investment incentives faced by high-income taxpayers and producers. Yeah, I like me some tax cuts: The Act reduces taxes for many individuals and families by doubling the standard deduction and reducing tax rates. More importantly, perhaps, it will also reduce taxes for C-corporations, providing some relief from double taxation of corporate income, as will the switch to a territorial tax system on U.S. corporations doing business abroad. The latter is a real reform, while I consider the former a partial reform. Investment incentives are improved via the corporate rate cut and elimination of the corporate Alternative Minimum Tax (AMT) — a real reform, as well as the ability to write-off spending on new equipment immediately. As I argued last month, lower corporate taxes are likely to benefit both workers and consumers. The actions of few companies (AT&T, Comcast, Wells Fargo, and Fifth-Third) seem to demonstrate that this is the case: they have announced bonuses and increases in their base wage rates in the immediate wake of the TCJA’s massage. Pass-through tax cuts are iffy: One of the most difficult parts of the TCJA to evaluate involves the implications for pass-through business entities like sole proprietorships, partnerships and S-corporations. Some might not receive significant cuts. The Act includes a maximum 25% rate on business income, but that is dependent on the proportion of the owner’s income deemed to be business income under the new rules. It also allows a flat deduction of 20% against business income. These provisions will be of benefit to very successful and very capital-intensive pass-throughs. Owners of smaller or less profitable firms will get the benefit of lower individual tax rates and the higher standard deduction, but might not have income high enough to benefit from the 25% rate cap. Simpler for some, but it is not simplification: The doubled standard deduction will mean fewer taxpayers claiming itemized deductions. That sounds like simplification, but many will find it reassuring to calculate their taxes both ways, so a compliance burden remains. The Act retains or partially retains a number of deductions and credits slated for elimination in earlier versions, failing a simple principle held by reformers: eliminate deductions in exchange for lower rates. Along the same lines, the individual AMT is retained, but the exemption amount is increased, so fewer taxpayers will pay the AMT. Again, simpler for some, but not real simplification. Elimination of the corporate AMT is simplification, as are immediate expensing of equipment purchases and territorial tax treatment. However, most of the complexities of corporate taxes remain, as do certain tax breaks targeted at specific industries. What a shame. And unfortunately, taxes for pass-through entities are anything but simplified under the Act. Complex new rules would govern the division of income into business income and the owners’ wage income. Reducing deductions and bad incentives: The mortgage interest deduction encourages over-investment in housing and subsidizes the wealthiest homebuyers. The TCJA leaves it intact for existing mortgages, but allows the deduction to be claimed on new mortgage loans of up to $750,000. So the bad incentive largely remains, though the very worst of it will be eliminated. There have been complaints that this change could reduce home prices in states with the highest real estate prices. Good — they have been inflated by the subsidy at the expense of other taxpayers. The tax write-off for state and local taxes (SALT) will be limited to $10,000 a year under the TCJA, though it adds some flexibility by allowing that sum to be met by any combination of state or local income, sales or property taxes. This change will reduce the subsidies from federal taxpayers residents of high-tax states, and should make leaders in those states more circumspect about the size of government. The TCJA preserves and even expands a number of individual deductions and credits, subsidizing families with children, medical expenses, student loans, graduate students, educational saving, retirement saving, and the working poor. The interests benefiting from these breaks will be relieved, but this is not simplification. Yet another case of “simpler for some” is the estate tax: it remains, but the exemption amounts are doubled. The estate tax does not produce much revenue, but it is fundamentally unjust: it ensnares the families of deceased property owners, farmers and small businesses; planning for it is costly; and it often forces survivors to sell assets quickly, sustaining losses, in order to meet a tax liability. The TCJA will significantly reduce this burden, but the tax framework will remain in place and will be an ongoing temptation to ravenous sponsors of future tax legislation. Individual cuts are temporary: The corporate tax changes in the TCJA are permanent. They won’t have to be revisited (though they might be), and permanence is a desirable feature for sustaining the impact of positive incentives. The individual cuts and reforms, however, all expire within eight to ten years. The sun-setting of these provisions is, as some have said, a gimmick to reduce the revenue impact of the Act, but sunsetting means another politically fractious battle down the road. It is also a device to ensure compliance with the Byrd Act, which limits the deficit effects of legislation under Senate reconciliation rules. Eight years is a fairly long “temporary” tax cut, as those things go; for now, the impermanence of the cuts might not weaken the influence on spending. However, that influence is likely to wane as the cuts approach expiration. Deficit Effects: The TCJA’s impact on the deficit and federal borrowing is likely to be somewhere north of $500 billion, possibly as much as $1.4 trillion. Deficits must be funded by government debt, which competes with private debt for the available pool of savings and must be serviced, repaid via future taxes or inflated away. In the latter sense, government borrowing is not really different from current taxes, a proposition known as Ricardian equivalence. Nonetheless, the incentives, complexities and compliance costs of our current tax code are damaging, and the TCJA at least accomplishes some measure of reform. Moreover, the incremental debt is small relative to the impact of prior estimates of government borrowing over the next decade, with or without extension of the individual tax cuts. The most fundamental problem that remains is excessive government spending and its competing demands for, and absorption of, resources, with no market guidance as to the value of those uses.